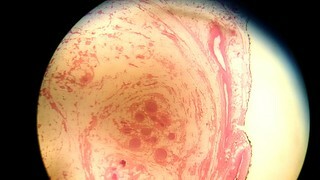 The low power view shows circumscribed lesion with the epineurium infiltrated by fibro-fatty tissue (2x, H&E). Contributed by Dr. Saroona Haroon, The Aga Khan University Hospital (Pakistan). Click here to see topic.